Juniperus conferta Blue Pacific forms a tight dense mat of foliage. The branches of the Shore Juniper grow quite long, rarely branching. The Shore Juniper is native to the shores of Japan. Juniperus conferta grows in sun to moderate shade. Juniperus conferta plants require decent drainage either by planting on a slope or mound if the soil does not naturally drain well. The gray-green leaves have sharp tips. 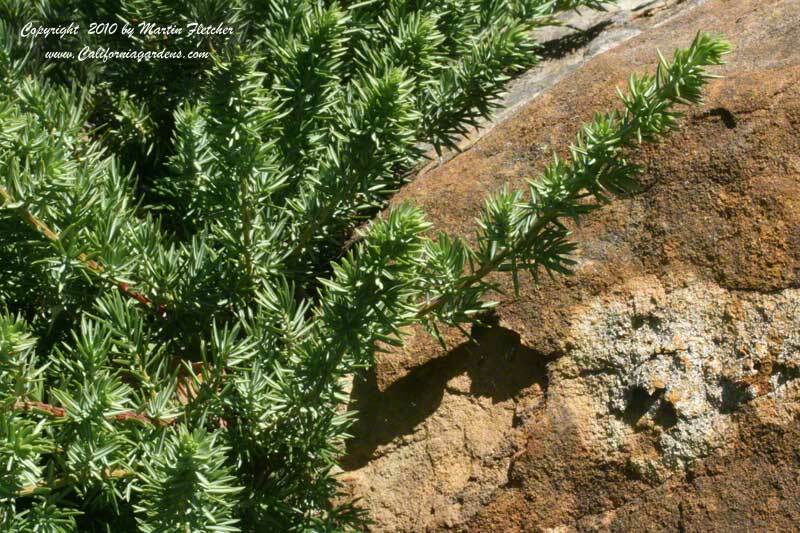 Juniperus conferta will slowly form a mat up to a foot or more thick and will gradually spread up to 10 feet wide. Juniperus conferta Blue Pacific is Winter hardy down to zone 5. Blue Gray foliage of Juniperus conferta Blue Pacific - Shore Juniper. High resolution photos are part of our garden image collection.